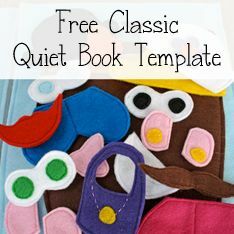 The first quiet book that I get to share with you this week is actually one that I made myself. My brother and his family were in town earlier this year, and my nephew had his first birthday while he was here. 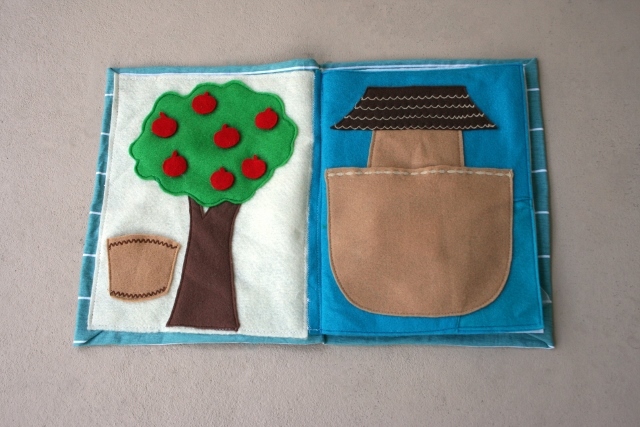 I knew that I wanted to make him a quiet book, but I also didn't have much time to make one (since we were doing things every day with my whole family). So, to speed up the process of making a quiet book, I altered my usual quiet book techniques in a few ways. First, and this was the biggest time saver, I only made four pages. Less pages naturally equals less time. Secondly, I used velcro (and not snaps) to attach the detachable pieces. 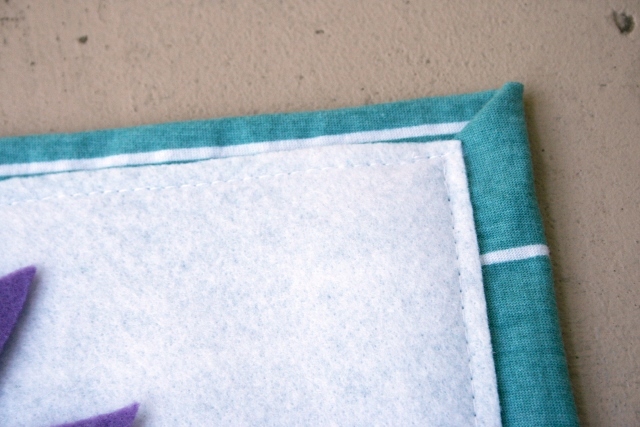 Snaps (since they're hand sewn) take longer to attach than velcro (which can be machine sewn or hot glued). Third, I hot glued all of the velcro pieces, on to the quiet book pages themselves and on to the detachable pieces. Hot gluing the velcro, instead of sewing it, saved a lot of time. I made sure that it was very sturdy and well attached. Fourth, I hot glued all the details. 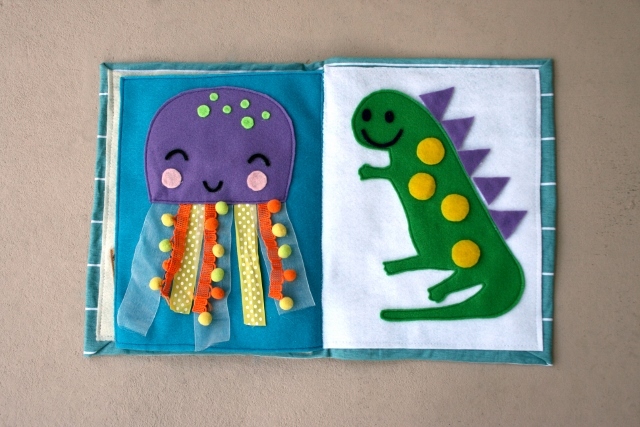 I sewed the main pieces on to each page - the tree and basket, boat, jellyfish, and dinosaur body - but hot glued the jellyfish's face and spots and the dinosaur's face on. 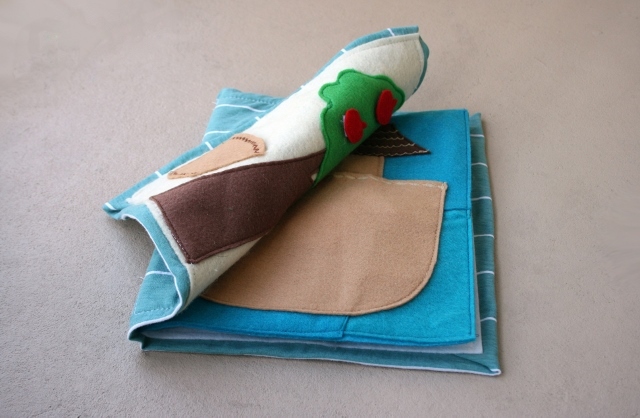 One thing I did with this quiet book that actually took more time, but was totally worth it, was sewing a cover. With my previous quiet books I've simply sewn button holes in the sides of the pages and then attached all the pages with binder rings. Not this time. 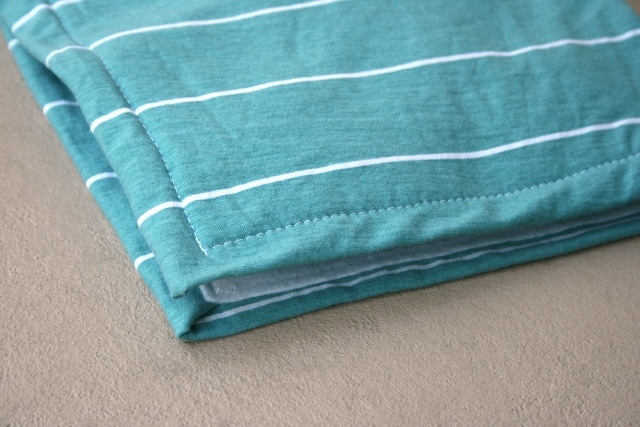 This time, I cut a piece of fabric from a big, old t-shirt, laid the pages down on it, pinned it everywhere, and sewed. 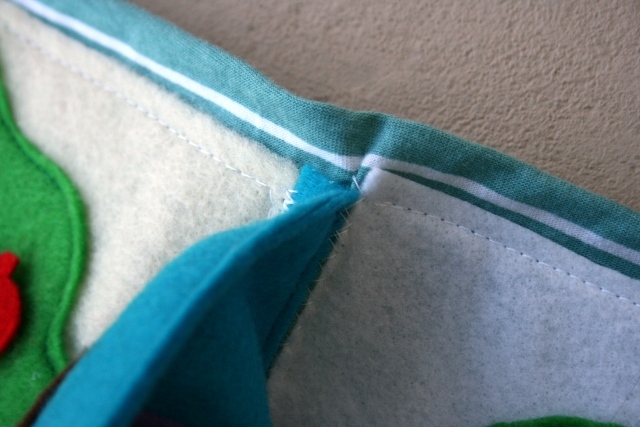 I sewed the front and end pages directly onto the cover, and the middle page I sewed to the middle of the cover by leaving some extra felt on the side of the page, and sewing that side of the page to the cover. (I'll show this with pictures at the end.) And I love it! 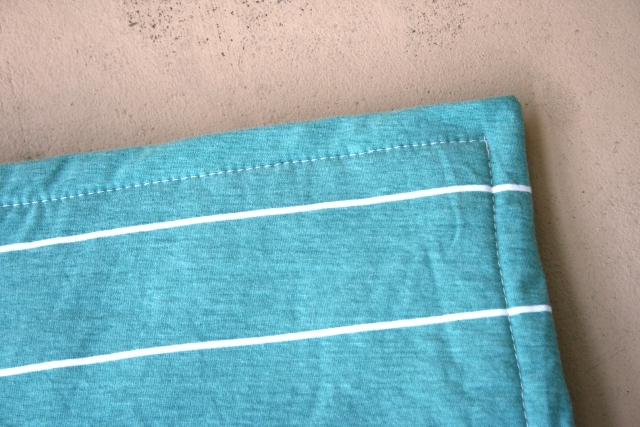 The book is all one piece, all attached, and since the cover is made of t-shirt fabric it is super soft and nice to touch. 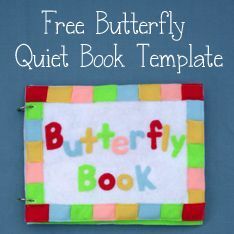 So, without further ado, here is my nephew Max's quiet book! I really like how it turned out, and I hope Max and my brother and sister-in-law like it too! I'm Jocelyn! I'm a homemaker and I like making stuff. My nephew, who just turned one year old. Ooh, tough question. I was totally going to mark down exactly how long it took me so I could tell you guys, but...I forgot. So, I'll just have to give you my best estimate. I worked on it at nighttime for a couple weeks. All told, I would guess about 14 hours? 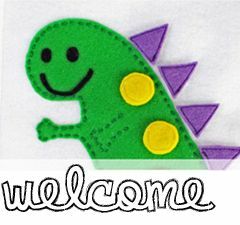 I actually used my own templates for the apple tree page and the dinosaur page (you can get them by clicking on those links). I didn't use a template for Noah's ark, just kind of winged it after looking at a lot of pages for inspiration. 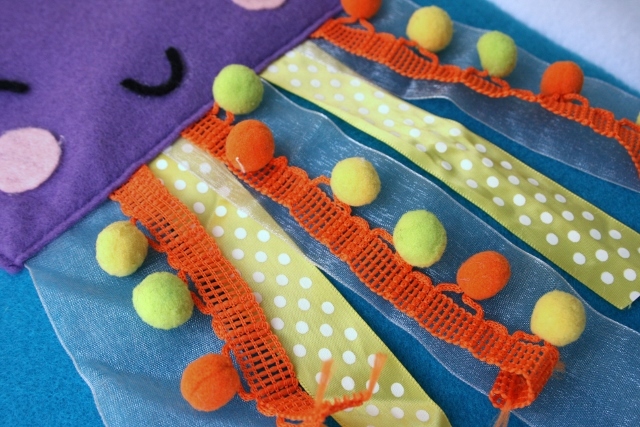 My jellyfish page was based on this jellyfish page. 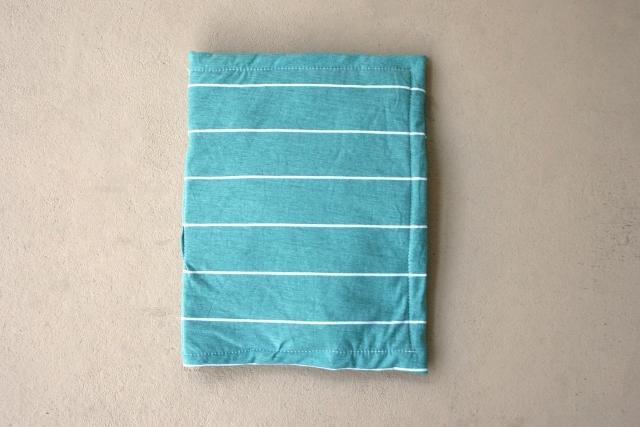 I cut a big piece of fabric out of an old t-shirt to use as a cover. 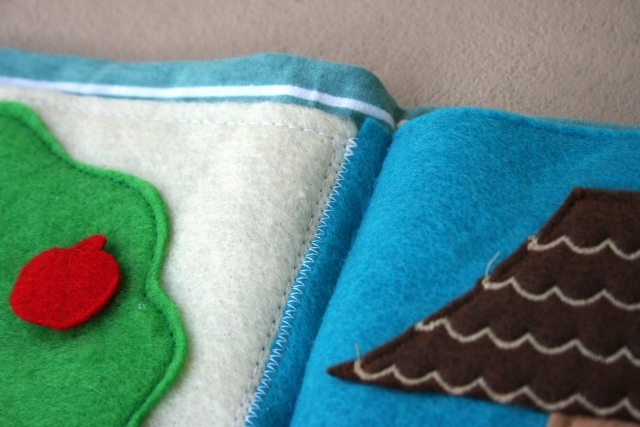 I sewed the first and last page directly on to the fabric (I turned in and sewed the fabric edges under the felt so that the edges are nice and clean). I sewed the second and third pages back to back, leaving room on the side of the page. 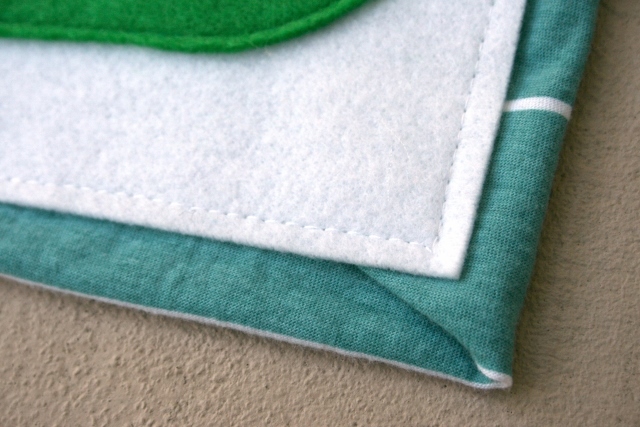 I used that extra room to sew those pages directly to the cover as well, in between the two end pages. I already had most of the supplies, and the extra supplies I needed (I think just velcro, and a page or two of felt) only cost me a couple dollars. 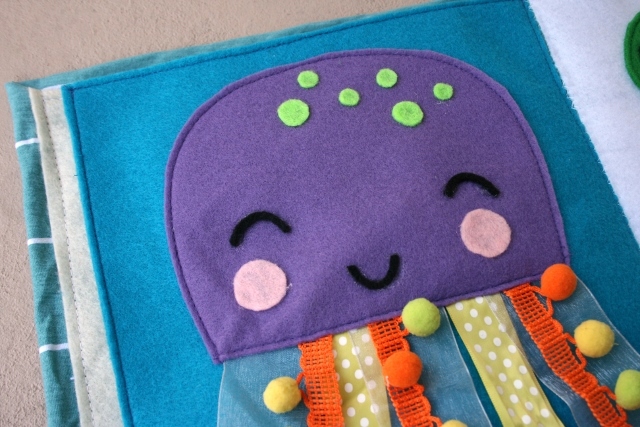 I think the jellyfish, because it's so colorful and happy. Hi everyone! Sorry I've been MIA during July. My family just moved across country at the beginning of the month, and we've been getting everything unpacked and settling in for the last couple weeks. But the dust is settling, and soon there'll be new quiet books up on the blog! We even have a giveaway coming up! So stay tuned in, we'll have some fun new posts soon!